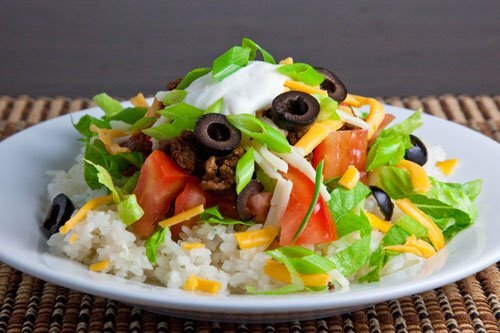 Taco rice (or tako raisu) is a Japanese take on the taco that is pretty much just a taco on a bed of rice. The main ingredients are the rice and the taco seasoned ground beef and from there you can add whatever you would normally add to a taco. The warm rice works surprisingly well in a taco soaking up the flavours of the seasoned meat. Very often when I make tacos I make extras meat so that I can make taco salads with the leftovers. That's a cool idea. I'll have to try it next time I make tacos. I just made this and it is so simple and delicious. I also added some avocado into the mix. I probably gobbled down the whole large plate in under two minutes. Thanks for the idea.